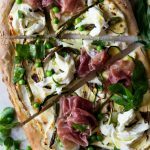 A white pizza with zucchini, prosciutto, asparagus and buffalo mozzarella. A thick crust base spread with ricotta and lemon zest and baked with zucchini ribbons and slices of asparagus. First, make the pizza dough. You can get full step by step instructions for making traditional pizza dough here or my instant pizza dough here. When you have your dough ready, pre-heat the oven to the highest temperature possible. Sprinkle the baking tray with semolina flour (see notes). Roll out half of the dough and place on a baking tray. Repeat with the second half of the dough on a second tray or bake one at a time. Mix the ricotta and lemon zest in a bowl with a pinch of salt. Spread one pizza base with half of the ricotta and lemon zest followed by zucchini ribbons and slices of asparagus. Drizzle lightly with olive oil. Repeat with the second pizza. Bake in the oven for around 10-15 minutes until the base is crispy and golden and the toppings are slightly browned. Once removed from the oven top with a few slices of prosciutto, peas, buffalo mozzarella and tear over some fresh basil and mint. Serve. Nutritional information is calculated using traditional pizza dough. Use semolina flour to dust the baking tray to stop the dough from sticking, this also gives a nice crispy base (you can also use regular flour or polenta for this). You can make traditional pizza dough ahead of time and freeze it. Simply defrost before using for a quick weeknight meal.